WASHINGTON, D.C., December 5, 2003 – As part of International Volunteer Day, Director Gaddi H. Vasquez and Peace Corps staff around the world took the opportunity to recognize the dedication of all volunteers attempting to create a better world. Director Vasquez thanked and honored the 7,533 currently serving Peace Corps volunteers and also recognized the more than 170,000 Americans that have served around the globe throughout the Peace Corps’ 42-year history of service. To commemorate the day, volunteer organizations in many countries hosted exhibits and presentations to honor the work of volunteers. As an example of one of these events, Peace Corps volunteers in Mongolia helped plan an exhibit hall presentation for the public that highlighted the accomplishments of Peace Corps and other volunteer organizations. As part of the presentation, 14 volunteers received awards for their contributions. Currently, Peace Corps volunteers in Mongolia are focusing on developing medium-size business projects, teaching English as a second language in secondary schools, working with the government to develop ecology management plans, and creating nutrition and preventative health initiatives. In Guyana, volunteers worked with the U.S. Embassy to host a health fair for local citizens. The fair emphasized living a healthy lifestyle and helped people plan workouts and healthy diets. At a park in Santa Domingo, Peace Corps volunteers gathered with members of non-governmental organizations, community leaders and members of the Dominican Republic government to hold a celebration of volunteering for 800 youth with live music groups, youth rappers, dancers, and to give the first ever awards to three schools for service learning. As a fitting way to recognize International Volunteer Day, 27 more Americans joined the ranks of Peace Corps volunteers and were sworn-in by the Ambassador to begin their service in Panama. Other volunteers recognized the day by introducing others to the idea of helping their local communities. In Bulgaria, Peace Corps volunteer Jay Gebauer took his class to the Straldja town park to clean up around and plant flowers. In Honduras, volunteers plan to host a festival on Dec. 13th in Tegucigalpa that will include a race, refreshments and tables with information about volunteer organizations and what they contribute to a community. 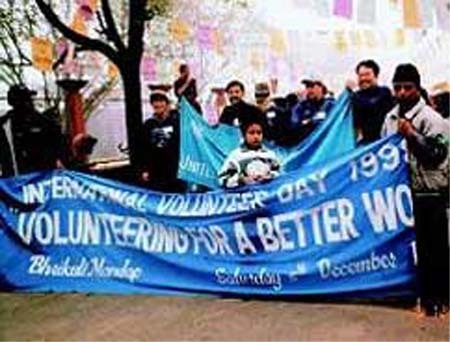 International Volunteer Day was created by the United Nations in 1985 to add visibility to volunteers’ efforts and social development at local, national and international levels. This year, the United Nations recognized over 146 events across the globe that honored volunteers from various organizations, including the Peace Corps. For more information on International Volunteer Day and related events, visit: http://www.worldvolunteerweb.org. To learn more about becoming a Peace Corps volunteer, please visit: http://www.peacecorps.gov, or call 1-800-424-8580. Since 1961, more than 170,000 volunteers have served in the Peace Corps, working in such diverse fields as education, health, HIV/AIDS education and awareness, information technology, business development, the environment, and agriculture. Peace Corps volunteers must be U.S. citizens and at least 18 years of age. Peace Corps service is a two-year commitment.